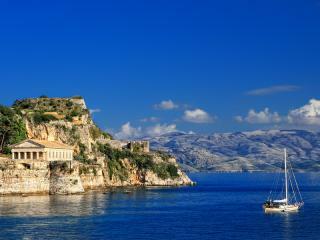 Affectionately known as the ‘emerald island’, Corfu is renowned for its natural beauty that stretches along the 200km coastline to green fields and lush olive groves that descend into the crystal waters of the Ionian Sea. Attracting thousands of tourists every year, Corfu accommodation is well equipped to cater for the influx of visitors and offers a great range of accommodation to suit all budgets and travellers. From pebble and sand beaches to sheltered coves, this historic island dates back as far as the Palaeolithic era and boasts a diverse legacy which allows visitors to experience European history in the one spot.